The Big Bang was an expansion of space, not like an explosion at all, despite what countless books, videos, articles and statements (even by scientists) often depict. 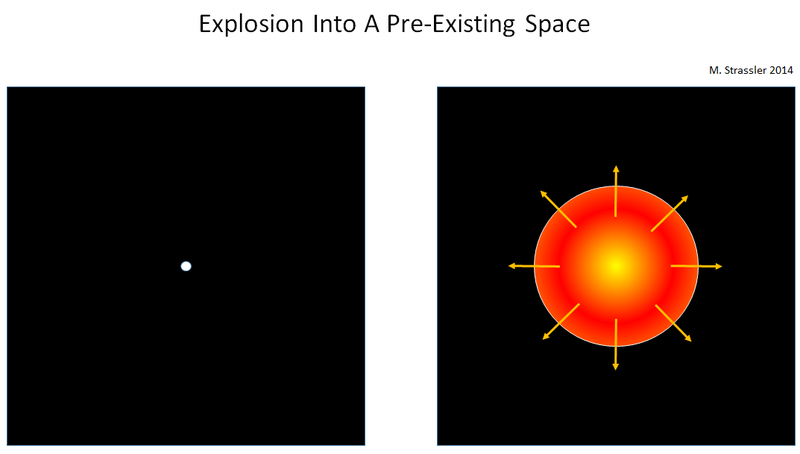 Let’s look at the differences between an explosion of something into space versus an expansion of space. In Figure 1 is shown a before and after of an explosion. Initially there is some space, with a seed — a bomb or a grenade or star or some other form of stored energy — sitting in it. The space is pre-existing, and so is the seed. Then something happens and the seed explodes. What was inside the seed undergoes some kind of transformation — for instance, a chemical reaction or a nuclear reaction — and energy is released. This creates tremendous heat and pressure inside the seed. The forces associated with the compressed heat and pressure cause the seed’s insides to expand outward as a hot ball of material. The energy comes out as the high speed and temperature of the seed’s insides, and the pressure and temperature gradually decrease as the interior of the seed expands outward into the pre-existing space in which it originally sat. Fig. 1: What the Big Bang was not: An explosion of a seed into a pre-existing space. The explosion is created by a process that generates tremendous heat and pressure inside the seed, which rushes outward as a ball of hot material exploding into the pre-existing space. The Big Bang is nothing like this. Notice that the cause of the explosion is a reaction that creates tremendous heat and pressure inside a tiny region. It is the imbalance between the huge pressure and heat inside the seed compared to the low pressure and temperature outside the seed that causes the seed to explode outward. And the things inside the speed move with high velocity, rushing apart from their initial location. Their speed relative to their starting point can’t be larger than light, so there’s a limit to how quickly they can recede from each other. 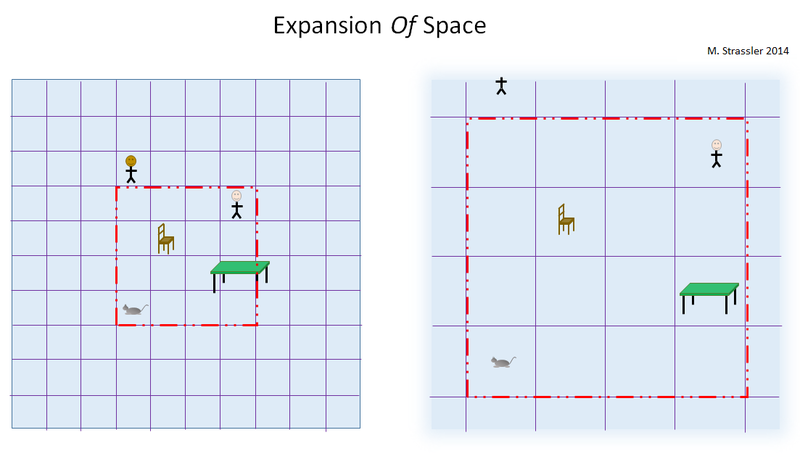 In Figure 2 is depicted the process (which may have already been going on before the moment of the left-hand figure) of an expansion of space. Between the left-hand picture and the right-hand picture, space has doubled in size, as you can see by the grid of lines. Things inside the space that are held together by powerful forces, such as chairs, tables, cats and people, do not expand — only the space in which they sit does. In short, space becomes more abundant, so there’s simply more room for the objects inside it. Note that the objects do not intrinsically move! There’s no heat or pressure pushing them anywhere; they’ve not been kicked. It’s simply that the space between them and around them is growing, appearing out of nowhere, making the distances between them larger than before. And the increase (for uniform expansion) is uniform. In the right-hand picture, the distance between the cat and the table has doubled; so has the distance between the cat and the chair. That’s what happens when the universe doubles in size. Fig. 2: The expansion of space is depicted by the growth of the distance between the grid lines. Normal objects remain of the same size, but the distance between them grows as the space uniformly expands. This type of expansion can occur either in a hot or cold universe, under the right conditions, and it can be very rapid. This kind of change in space itself is possible in Einstein’s theory of gravity but not in Newton’s older one. For Einstein, space is not just a place where things happen; it is a sort of thing itself, capable of growing, shrinking, deforming, wiggling, and changing shape. (Actually it’s space and time together which can do all of that!) Ripples in space-time are called “gravitational waves”. Since it is space that is expanding, and it is not the objects that are moving, Einstein’s relativity puts no constraints on how fast the distance between the objects can grow — i.e., no constraints on how rapidly space between the objects can appear. It is possible for the distance between two objects to grow much, much faster than the speed of light. This is no contradiction with relativity. People often say, with loose and imprecise words, that “relativity says that nothing can go faster than the speed of light”. But “nothing” and “go” are ambiguous, and in science we learn that imprecise words cause trouble. Einstein’s words (if you read them) are often ambiguous and easily misunderstood, though he tried to be precise. But Einstein’s equations are not ambiguous. The precise statement of relativity is that if two objects pass each other at the same point, then an observer who is moving with one of the objects will measure the speed of the other object to be less than or equal to the speed of light; and vice versa. But this is not in contradiction to the statement I’m making here: that the distance between two objects at different points can grow faster than this. And that will always happen, in a uniformly expanding universe, for two objects that are far enough apart. Notice also, very importantly, that the cause of the expansion of the space need not have anything to do with heat or pressure… unlike an explosion. I’ve deliberately drawn normal objects like chairs and tables so that you can see that, in contrast to an explosion which will damage or destroy normal objects, an expansion can leave them untouched, just increasingly separated. Expansion can occur in a very hot universe — and early in the universe’s history, that did happen, during the Hot Big Bang. But expansion can also occur in a very cold universe. It is currently suspected that this, too, may have happened early in the universe, during the inflationary period. And of course our universe today is rather cold, yet not only is it expanding, the rate of expansion is increasing. The Hot Big Bang, whose final stages we are living in, is an era that somehow began, at some moment in time, as a large region of space filled with a hot dense soup of particles, expanding and cooling very rapidly at first, then more and more slowly until just a few billion years ago. It did not begin as a point object that exploded into empty space. How the Hot Big Bang may have begun after inflation is explained at the end of this article on the Era of Inflation. Wouldn’t a very quick expansion destroy objects because the electromagnetic forces that keep them together couldn’t do so anymore? Yes, and it is called the Big Rip. Big Rip is one of three ways Universe could “end” with expansion increasing so much that nothing would hold together. I’ve wondered about the LIGO observatory that is intended to directly detect gravitational waves, by means of it’s 2 long, perpendicular interferometers. A gravitational wave is supposed to alternately stretch/compress space, thereby affecting the 1st leg of the interferometer relative to the 2nd leg. Why wouldn’t the light waves inside the 1st leg also stretch/compress in the same proportion, resulting in no net signal? a) Even if your concern were correct, why would it lead to no net signal? There’s no correlation between light waves and gravitational waves; you can put the thing in a metal room and there will be no light waves (e.g. radio waves) getting into the room, but the gravitational waves will waltz right in. So there certainly won’t be some kind of cancellation between gravity waves and light waves. b) Light waves don’t compress electrically neutral objects. They’ll move electrically charged objects around, but not ordinary atomic matter made from electrically neutral atoms. Radio waves do not, as they pass through a building, cause it to stretch and compress. But gravity waves affect everything. They will stretch and compress anything they pass by. So they have completely different effects. @TomH – At the risk of completely misleading you (I’m pretty clueless about all this stuff), let me express my current understanding of a question I had/have which may be the same as yours (or may not, IDK). I had wondered for decades why/how it could be that gravity waves, which are OF the structure of space time, could be measurable IN space-time. My 2 dimensional analogy is that all points embedded in a sheet maintain there distance when the sheet is wrinkled, those points can’t “know” that the sheet is distorting (as an embedding in some higher dimensional space)…all distances in the sheet remain the same (of course, this assumes that the sheet isn’t bent so severely that discontinuities develop (fractures? new ‘space’ ?)). The answer I have now – tentative although it is- is that it is the ‘tidal’ forces which are being measured. So. Picture a spaceship (long and thin) falling towards a planet. Its easy to understand that the front (lower) part of it will be experiencing more acceleration than the back, although for any reasonable length, this effect would be small (unless we are talking about falling into black holes or other hyper-heavy objects). But picture the same spaceship again falling towards the planet, but this time oriented horizontally, (its long axis normal to the line between the center of the planet and the center of mass of the ship). Now, for reasonably sized ships the entire ship will experience the same acceleration. But what if the ship is (say) 3 times the length of the planet’s diameter? Well, clearly the center of the ship will be radially closer to the planet than either the nose or the tail. Again, this causes different acceleration. In both of these scenarioes, there are stresses on the metal structure of the ship, call them tidal forces. Shrink the ship down, and all that happens is these tidal forces also shrink. They don’t disappear, they “just” shrink. So, IF we could devise a clever way to measure these tidal forces (LIGO), then we could measure variations in the gravitation. See? We can use this same ‘clever way’ to measure gravity waves! Perhaps Matt will comment on whether this is totally off base, or kinda, sorta ‘ok’. Matt, delete this post if I’m just too wrong and misleading. Thanks! Can you “expand” on what you mean by the Big Bang being an expansion of a “large” region of space? How large? I understand your desire to steer people away from the idea of an explosion, but dismissing the idea of an initial singularity is new to me. Does this have any connection with Penrose’s notion of scale ceasing to have any meaning when all you have are photons, so that a new Big Bang can follow directly from the expiry of a previous Universe, with no need for an intervening contraction? Even if you had an initial singularity, it’s still not a point in space, but a moment in time. If you run the Big Bang naively backwards, you don’t get a location of infinite density; you get a time where the whole universe is of infinite density. But even then — once the density reaches the Planck density, we know that quantum gravity will be important, and that Einstein’s equations can’t be used without modification. So we don’t trust the singularity in Einstein’s equations; that’s just probably an indication that you’re trying to use the equations where they don’t apply. I don’t understand Penrose’s notion. No one knows how “large” the initial region of space may have been … it could have been very small or very large … or even if the notion of an “initial” region makes any sense. It’s not clear that space has any meaning at the early stages of the universe; we have examples of theories in which space emerges only later. It’s not even clear that time makes any sense back then either, though that’s hard as heck to think about. So I’m afraid you’re going to have to open your mind and let the possibilities grow larger, rather than grasp for an answer. We don’t have one, and the possibilities are probably larger than we currently realize. Thank you very much for these articles, and for the great work on your blog in general. You write “Things inside the space that are held together by powerful forces, such as chairs, tables, cats and people, do not expand”, I would like to know what’s the criteria for the word “powerful” here, and if there are structures or things not held together powerfully enough (but still held together weakly). In other words, does the expansion “push” objects apart very very slightly or just doesn’t push them at all? I can see that an electron is not being pushed away from its nucleus due to expansion, but what about 2 galaxies in different galaxy clusters? are those not held together weakly (by gravity) in a way that’s not enough to defeat the “push” of space expansion? I’ve heard that the calculated enthalpy of the Big Bang is similar to an explosion. I totally get it that nothing moves. And, in an explosion, one expects that the bits would be moving. The CMBR dipole strongly suggests that we’re not moving more than locally. In a space even the size of our visible part of the Universe, if everywhere had some pressure, i don’t see how it would cause expansion. There’d be nowhere for everything to expand to, since the same pressure is everywhere. Pressure would have to be communicated at the speed of light (at best), and there hasn’t been enough time to make it to the “edges”. And, the “edges” would presumably see counter pressure. It makes much more sense that space is expanding, and carrying everything with it. And yet, i’m comfortable with the Big Bang explosion as an analogy. We know that all analogies break down. If an analogy doesn’t break down, it’s not an analogy – it’s the thing you’re talking about. So, when you’re talking about the Big Bang, you talk about what is the same, and also, what is different, with your analogy. But the analogy can give your audience visualization to start with, however misleading it might be. The raisin bread visualization is useful, but i don’t expect to be able to eat it. Could we postulate, that the Big bang was the splitting and evaporation of the big cunch black hole into what I call a black hole splitting fractal inflation creating the Lyman Alpha tree structure? Matt, I really do not understand “space expanding”. With respect to what? What I mean is, in space I might say that x(2) – x(1) defines a unit of length, say a meter. It seems to me it always does, unless there is some underlying ruler, deeper than space itself, but that to me seems difficult to follow. Another way of looking at it is that “expansion” implies that x(2) is moving away from x(1), but that only makes sense if there is a ruler to measure distance with, and if space is expanding, surely so does the ruler. But if the change in length, in terms of ruler lengths, is constant, how can you say there is expansion? I hope you don’t think I am a pest asking this – I just don’t understand. Dr. Strassler, how can the expanding universe not have a center if it is flat (having zero curvature)? That is, I can understand how the universe could be the three-dimensional surface of a hypersphere; if the sphere is expanding, then every object on the three-dimensional surface will grow more distant from every other object. But if the universe is just a sheet (does that mean not closed?) then how could it not have a center. If it were an infinite sheet, I suppose it would not have a center–but if the amount of mass in the universe is finite, wouldn’t that mass have a center? I am probably conflating many half-grasped ideas from a multitude of sources (and I have a very limited and tenuous grasp of physics, let alone topology), but I would be very grateful if you could point me in the right direction (when you have the time). Thank you. I meant, if objects are evenly distributed over a finite, but unbounded surface. That is, I can understand how the universe could be the three-dimensional surface of a hypersphere; if the sphere is expanding, then every object on the three-dimensional surface will grow more distant from every other object. the rate of expansion is measure , if yes on what ? To expand on my previous question, in diagram (2) either the cat expands as well or, as appear to be the case in diagram (2), it does not. In the latter case, the cat’s nose, tail, and feet are sufficient, surely, to define an inertial frame of reference. If so, surely the table, etc IS moving away in that frame of reference at a velocity dr/dt, r the distance to the table in the cat’s frame of reference. If, on the other hand, the cat is expanding at the same rate as space, r is constant and the cat sees no expansion at all. What have I missed? Thanks for the excellent explanations on your site, and thanks Cern for recognizing your responsibility to the public who fund the work. Consider 2 chairs separated by 1 mega parsec, if the chairs have no relative velocity at a point in time, they will 1 second later have a separation velocity equal to the Hubble constant. ( I am not sure where the kinetic energy came from but I will ignore it). With the same initial conditions as above but now with each chair being given a tangential velocity about their common center sufficient for the chairs to orbit each other and so form a bound or virialised system. In this case there will apparently be no expansion between the chairs even though the tangential velocity would amount to a movement of about an atoms distance in the 1 second. Any thoughts where I have erred or pointers to papers that set out the maths in a rigorous manner, as so far my search has been fruitless. When I took astronomy in college some 40 years ago, we were taught that there was an infinitely dense mass called “ylem” that expanded. Do physicists still believe this? I do not see that term referred to anymore. Also, where the ylem come from? How did it get there? I am not religious, but I still don’t see how you get something out of nothing. Also, I’ve read a lot recently about the “multiverse”. I am very dubious of this concept. I do not reject it out-of-hand, but it seems to me to violate an important principal of science, namely falsifiability. It may be that there are an infinite number of universes (although I think one is enough, thank you very much). It may also be that there was an evil emperor named Xemu who created the world 75 million years ago, which is what the nutty Scientologists believe. I can’t disprove either proposition. Could you please explain to me why so many scientists today seem to endorse the multiverse idea? Thanks for your efforts in creating this page. Its my first time on this blog and i am glad to join in. I am probably wrong but i would like to know if this theory is true.That our planets are actually in the middle of nowhere and are dropping. While this is happening, space maybe vanishing from one end(if there is any) and being created on the other end. It is like new space being created while old space is being destroyed(like the crust of the earth). Because of this, I still do not understand the expansion of space for space would remain the same size but the solar system, stars and if so other universes may be or would be wiped out.There could have been existing planets way before but because of this process, they might have been wiped out.The expansion of the sun is indeed correct but the expanion of space i would research a bit more on and comment again next time. Thank you for your time. I believe that we have been looking at the issue of the Big Bang and the creation of space and time from the wrong perspective. I believe that our focus should be light and the speed of light. I postulate that an absolute requirement for space and time to exist are speeds lower than the speed of light. My theory is that the Big Bang is due to deceleration from the speed of light. creation of space and time. 1) Blogs containing the word “truth” in their title generally do not contain much truth in their content. Yours is a typical example. 2) Your “theory” about the Big Bang is not a theory. It is just some words you have written down. They make no sense. Your comments would have been useful if you had explained why my comments are useless since you did not I regard your comments also as words and useless. I would however still like to hear why my postulate is useless . I found this page looking for an answer to a (dumb?) question, and based on your description of space, maybe I’m at the right place. I’m trying to conceive of energy during the Planck era, though I understand that none of our physical laws can apply to that era. It is my understanding that at Planck time, space was thought to be a Planck length. Can we assume that this quantity is larger than the size of the universe at time=0 and that the universe “expanded” during the Planck era? If we can assume that expansion, can’t we attribute that expansion, or creation of space, as a fundamental property of energy, since (presumably) nothing but energy (no matter) could have existed at that time? This would seem to describe energy more directly than the extant, indirect descriptions of energy through interactions with matter (the four fundamental forces, the 2nd law of thermodynamics). we poor little lost in the woods humans are not capable of proving anything that this piece alludes to. we do not have the mental capacity. we exist, and that’s about as far as we’re likely to get, except for the ordinary day to day discoveries that have nothing to do with anything supernatural. and this and other speculations are supernatural in that they all postulate, but have no physical hold-it-in-your-hands proof. i wish we did. but at least it entertains us and keeps our “minds” busy. something happened. a “creation” happened. past that, no one knows. but maybe when we hit that type three civilization, we’ll have a little more to go on. AHHHhh, excellent thoughts. I never liked the use of the words “Big Bag” because they totally “distort” the minds of people and even scientists on how the Universe grow and is still growing. Matt, your figures depict the expansion of the Universe correctly in my mind. Over and over and over again in scientists publications they depict the expansion of the Universe as an explosion (like the explosion from a rifle bullet). Good grief, that is NOT how the evidence that Hubble observed and from what others show. From my reading space and time did not exist before the beginning of the Universe. It was only after the beginning of the Universe that time and space began. From my perspective if one views the beginning of the Universe as an expansion from literally a point, then there is no need for all the “fudging” that goes on with the inflation theory. In fact, no need for the theory. Thank you for presenting the expansion of the universe in a very clear understandable manner. That is precisely what is going on now and has been going on from the beginning of the Universe. this is a great article!!!!!!!!!!! The equation to perform this is 2 X a meg parsec X light speed (C). This total is then divided by Pi to the power of 21. This gives 70.98047 kilometres per sec per meg parsec.